If anyone has an objection to Phoenix Wright, that objection should immediately be overrruled. Sustaining such popularity as a character requires charisma, swagger and having an art book certainly helps as well. After a hiatus as the lead protagonist of Capcom’s popular legal thriller video game series, the original Ace Attorney has returned as the series’ top defense lawyer. Now fans of the titular hero can relive his return with a fantastic new art book The Art of Phoenix Wright: Ace Attorney - Dual Destinies. The book collects the artwork behind the latest installment in the popular Capcom franchise and includes character designs, pin-ups, storyboards, key art and much more! Phoenix Wright, Apollo Justice, Miles Edgeworth, Athena Cykes, and many more fan-favorite characters are all here and accompanied by character profiles, rough concept notes and creator commentary. UDON is also supporting this new art book launch with a new printing of the long-out-of-print “The Art of Phoenix Wright: Ace Attorney,” covering the first four games in the series. IN ONE FANTASTIC ART BOOK! Toronto, ON – Oct 20, 2015 – Phoenix Wright™ is back! After a hiatus as the lead protagonist of Capcom’s popular legal thriller video game series, the original Ace Attorney has returned as the series’ top defense lawyer. Now fans of the titular hero can relive his return with a fantastic new art book - THE ART OF PHOENIX WRIGHT™: ACE ATTORNEY™ – DUAL DESTINIES. The book collects the artwork behind the latest installment in the popular Capcom franchise and Includes character designs, pin-ups, storyboards, key art, and much more! Phoenix Wright, Apollo Justice, Miles Edgeworth, Athena Cykes, and many more fan-favorite characters are all here and accompanied by character profiles, rough concept notes, and creator commentary. UDON is also supporting this new art book launch with a new printing of the long-out-of-print “The Art of Phoenix Wright™: Ace Attorney™”, covering the first four games in the series. 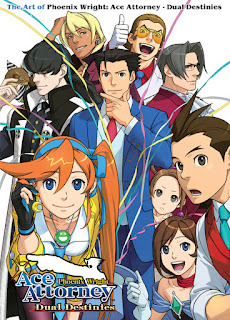 And with the recent announcement of an upcoming sixth entry in the series, Ace Attorney fans have plenty to celebrate! THE ART OF PHOENIX WRIGHT™: ACE ATTORNEY™ – DUAL DESTINIES is in stores now. Media inquiries and/or requests for review copies should be directed to Jenny Myung at press@udonentertainment.com.